Welcome to my review of the Celestron 71400 TrailSeeker 8×32 Binoculars Binoculars. 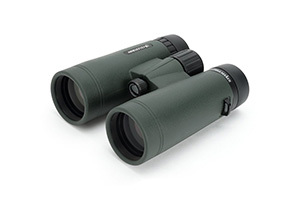 This set of binocoulars is advertised as being lightweight and durable, which is just what you need when you are taking binoculars out into the field with you. How well Celestron delivers on that promise, though, is what we’re out to find out in this review. As you can see, Celestron has included everything you could ask for, and more, in the box. The accessories are thoughtfully made, and both the neck strap and harness strap are very comfortable to wear and use. The carrying case comes with a removable shoulder strap and a belt loop on the back. The Celestron 71400 TrailSeeker 8×32 Binoculars features 32mm objective lenses, and provides 8X magnification. The clarity and resolution of the magnified image is fantastic, with a crystal clear image and excellent contrast. Celestron has manufactured the 71400 TrailSeeker 8×32 Binoculars with BaK-4 roof prism glass, which provides an excellent view in a compact frame. The optics are fully multi-coated, providing fantastic light transmission in all lighting conditions. I’ve used the Celestron 71400 TrailSeeker 8×32 Binoculars in low-light conditions with excellent results, being able to scout out hunting spots with ease even in the early morning hours. I’ve also used these binoculars for birdwatching, and the clarity and crispness of the image is fantastic. Celestron is well-known for their telescopes, and their binoculars meet those same exacting standards. The Celestron 71400 TrailSeeker 8×32 Binoculars is nitrogen-filled, so the binoculars are fogproof. They also have the lenses O-ring sealed, so the binoculars are fully waterproof for use in any weather conditions. If you get nervous about rain, Celestron includes a rainguard that works beautifully. The close focus of the Celestron 71400 TrailSeeker 8×32 Binoculars is 6.5 feet, so you can see things close up in 8X magnification. The linear field of view is 409 feet at 1,000 yards, giving you plenty of view of the terrain far away. Eye relief is a comfortable 15.6 mm, and the eyecups are metal multi-stop twist up cups, so you can correctly position the eyecups for your eyeglasses. Celestron has even thought to include a tripod mount on the binoculars, so you can have a steadier image or set up a view to share with someone else. The frame is made from magnesium alloy, making the binoculars lightweight and durable. The total weight of the binoculars is only a pound, so you can carry the TrailSeeker around all day without being weighted down. The ergonomic design of these binoculars is easy to grip, and the body has just enough texturing to provide for a non-slip surface. The binoculars measure 4.8″ wide and 4.8″ deep, standing just 1.9″ high. This is a comfortably compact design, but not so tiny as to be difficult to hold. I’ve used these binoculars for hours at a time without any hand cramping or other problems. These binoculars are waterproof, fogproof, and the body is so durably constructed from magnesium alloy that the Celestron 71400 TrailSeeker 8×32 Binoculars are practically indestructible. I wouldn’t try to put a bullet through the frame, but I’ve dropped these a number of times without any damage done to the binocs. Thanks for reading my review of the Celestron 71400 TrailSeeker 8x32 Binoculars. Celestron has produced a fine set of binoculars that balance weight and size with functionality, and these binoculars definitely fit the bill for a quality set of binoculars in a lightweight and easy-to-carry and use frame.